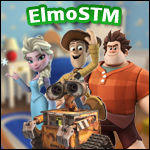 Disney Infinity Fans • View topic - Craig's Customs! So many of you may have seen these guys already, I have posted them on Twitter before, and I posted them on a facebook group as both are much easier to post pictures to! But I have finally gotten round to resizing etc to post them on here. 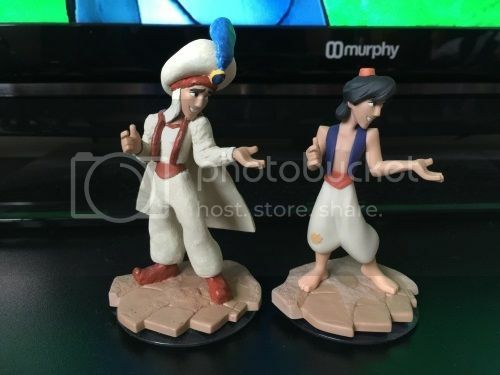 The great thing about Disney infinity is the costume discs, this lets me make customs and they actually appear in game looking the same as I make them! So although I have thousands of ideas for customs of non in game variants, right now I'm focusing on in game appearances. My niece is 5, and I love playing this game with her, and the great thing about my customs showing up in game the same, is she plays with them as much as the originals! I wouldn't like for her to put a figure on the base, and it comes up looking totally different. I experienced this with Skylanders (what, don't look at me like that, it did come out first! 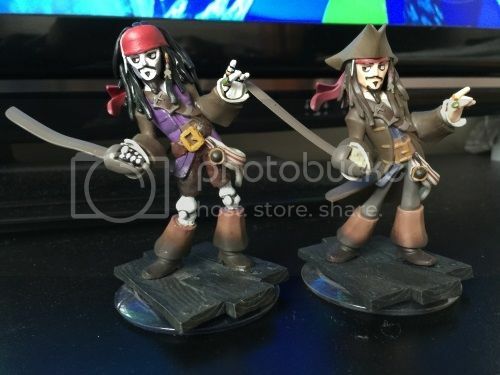 ), I made a few customs to represent their lost island personas, but they didn't appear in game as the figure and my niece would always ask me why. Disney lets me keep my creativity going, and lets her play with even more figures! 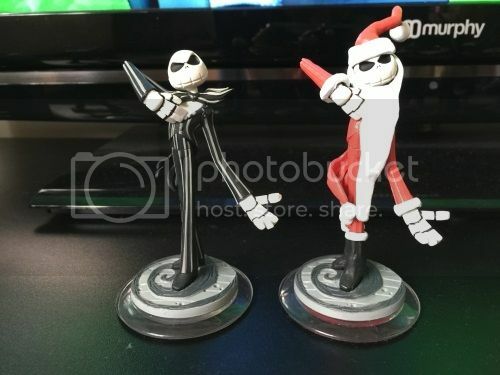 So hats off to Disney infinity, and I hope there are many more costume discs coming! Mr Incredible's Glory Days costume! Being this my first custom for some time, its a bit rough, and I used acrylic paints for this one, which was a bad idea. It doesn't come out as smooth as model paints. Maybe one day I will get around to re-doing him, but for now that's him! Sandy Claws! I made him especially for Christmas day. He stood downstairs with my family whilst we opened presents! Also he was a hit with JV! which inspired me to make all the costumes! Next I did Iron Man's Mark 42 costume, well, saying its easy is just because it was a repaint. 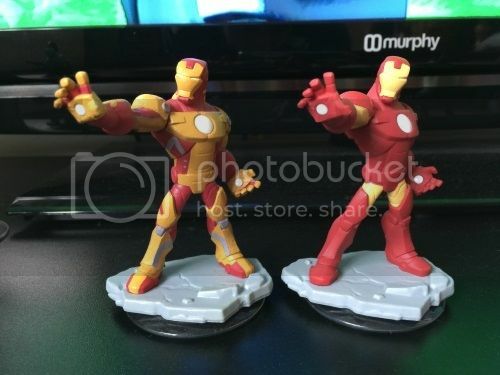 He required so much re-painting, the more I looked at it the more I was unhappy with sloppy paint lines or skipping area etc, but finally I'm happy with him (I'm now hoping we get MANY iron man costume discs for his many variants, i'd love to have a little army of iron man figures! 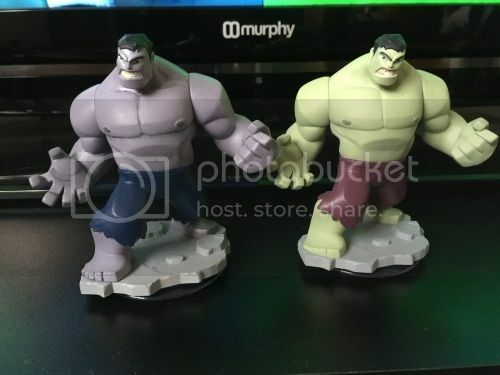 Grey Hulk/Ultimate Hulk, depending on what you associate grey hulk to be! Personally I consider this to be ultimate hulk, because then I have another character - He was a pretty easy repaint. I do hope we get some more hulk costumes, red hulk, blue hulk, maybe even 2099 hulk, he would be a challenge to make! 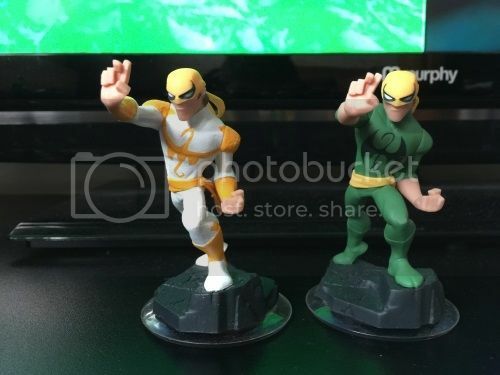 The immortal iron fist! I thought this would be an easy repaint. It was not. White paint is horrible to use. The first time it was all lumpy and inconsistent, I had to use paint thinner and strip all the paint off of him and start from scratch. Sentinel of Liberty Captain America. I'm really happy with how this one came out. 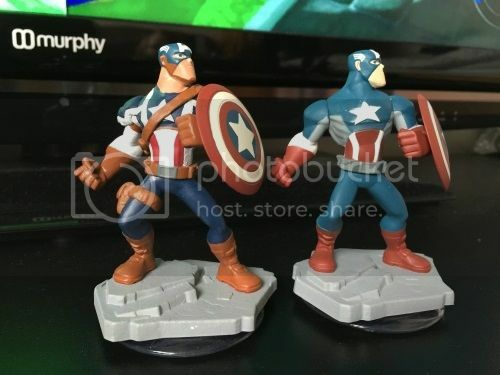 I just wish i'd held out until I had two Captain America figures, as the second I bought had an awful paint job. (I don't know if you can see, but look at that star on his chest!) So here's holding out for a costume based on his incredible uniform he wore for the movie Winter Soldier. Three Musketeers Donald! This one took a while, especially as the hat was very difficult to make. Luckily I had duck feather pillows, so he could have a real duck feather in his hat! 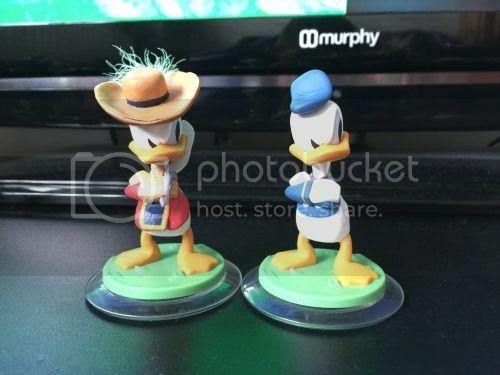 Now we are getting a new Mickey for 3.0, I hope we can get all the Musketeers eventually. Next, I told JV this one would be impossible, so I challenged myself to go ahead and do it! Space Armour Gamora! Now I'm not up to date with guardians comics, so I've no idea why she requires this armour. 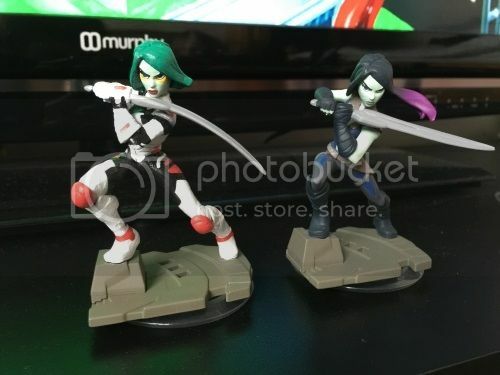 But I'm well aware, with the kids playing infinity, we're never going to get Gamora's original costume. It's a bit too... naked. The photo doesn't do this figure justice, I'm really happy with how she came out. It looks totally different from the original. Skeleton Jack! As you can probably tell, this one took some dismembering! I did his hat first, adding new dreads looked really cool! Carving his jacket off wasn't easy... and then I had to hack his legs off... All in all, I'm quite happy with this one. Someone on facebook I think it was, suggested I add an Aztec coin in his hand, this is something I am going to do when I get home. I left my figures at home this term (200 miles away). Prince Ali! Ironically this one didn't take that long. Despite having to resculpt basically all of him! But I did have the entire day off to play, so yeah, I had to yank his hair off and make his hat. Then pull his legs off and make the trousers. Then sculpt the rest of his clothes. Then make a cape! Painting him was what took the longest, he required several coats. I think he still requires a few more. And sanding down a little. Ultimate Falcon! I had a couple days left at home to quickly throw this together. Most of him was quite easy, a few little resculpted bits. His head was a pain, the glasses were hard to make, I'm still not 100% happy with them. And the helmet the original has is quite imposing. The wings were really difficult. 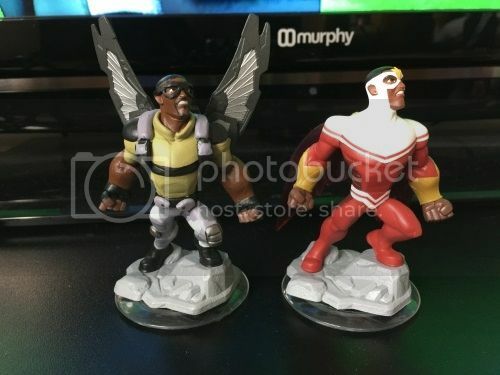 Obviously I didn't sculpt those, I had another falcon figure I picked up from a toy store, and cut them off of him. But sticking them in that pose was really difficult, they just wouldn't stick together. In the end I think he looks pretty cool though! Now I just finished Winged Maleficent as after watching the movie for a second time I felt she needed it! I know she's not a costume change, but as she can get her wings in game I felt it was worth it as the game still represents the figure in some fashion (Loophole!) but I haven't uploaded her photo onto the computer yet, so I shall do that when I can be bothered as this post itself has taken almost an hour! My next project shall be to build a cabinet to keep everything in. These are awesome! I am only missing three things to be able to make these myself: Time, talent and money. 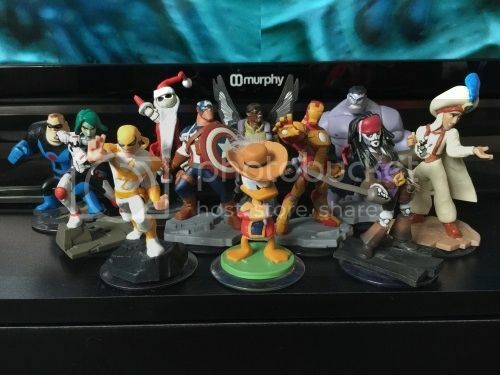 the facebook group I post pictures in is the Disney infinity group, the one with like 6000 members. But I haven't posted Mal on there yet either. I'm not 100% sure if that will work as I don't know if you need an account to see stuff in twitter. I will post her on here eventually . As for what I use, I use 'green stuff' (yeah its really called that) epoxy putty. Its fairly simple to use, id advise getting metal sculpting tools (tend to be candle or wax sculpting tools), their on ebay for a couple quid. And a glass of water, keep your fingers and tools wet when using them, else the putty sticks like crazy and it ruins your sculpts! 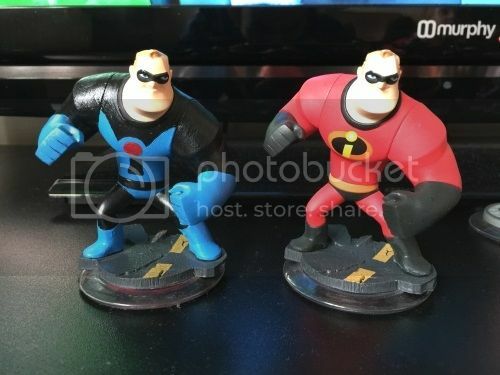 If anyone is considering starting i'd recommend using mr incredible as a first, hes nice and simple, large build, no sculpting, so its nice to ease into it. Damn man that's some lovely won't work. All sculpted? Yeah they do look great amongst the other figures! Plus when I get black suit spiderman this takes me up to 80 figures already prior to 3.0!